When the sky is grey and the landscape is grey/barren, colors explode and vibrate. 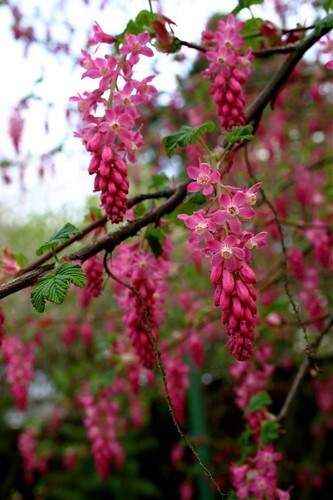 It's because of this lack of color that I'm so grateful for spring and when I see it through the beauty of nature, like this flowering currant (Ribes sanguineum). Beautiful! I was photographing a currant yesterday and only hope I got a shot half as nice as this. You write GREY!!!! Nobody in the US writes GREY! I got counted wrong in 2nd grade on a spelling test because I wrote GREY. You couldn't tell it has affected me for my entire life since, could you?